When removing excess moisture from your inside air, it helps you save to get the most efficiency from your appliance. This guide contains energy saving tips for using dehumidifiers. If left untreated, too much moisture indoors can lead to a host of issues, the least of which is the growth of mold and mildew. Dehumidifiers work by removing excess moisture in the air. Here are some tips for getting the most energy savings and efficiency out of your dehumidifier. Prevents the growth of mold and mildew. Dry air feels cooler. That saves energy (and money) by reducing your cooling bill. Humidifiers fall into three categories: residential, commercial, and industrial. Unless you're working with a very large area or extremely moisture-laden air, most homeowners can get by fine with residential-grade models. Dehumidifiers vary greatly in size and price. Capacity is measured by the number of pints of water the unit can remove in 24 hours. The size you will need depends on two things: the size of the area to be conditioned and the amount of moisture present in the air. Common residential sizes include 25, 30, and 40-pint models. The Association of Home Appliances recommends a 25-pint model for most areas up to 1000 square feet and a 40-pint model for areas up to 1500 square feet. To see long-term savings, it's always best to buy the unit that best fits the size of your space. As a general rule of thumb, it's always better to go with a unit slighter larger than you think you need. For example, if you're choosing between two models, one rated for 1000 sq feet and the other for 1200 sq feet, and your space is only 900 sq feet, choose the model with the larger capacity. A larger unit won't have to work as hard to dehumidify the same space as a smaller unit. In addition, a smaller unit will run longer, leading to higher energy costs and greater wear and tear. One way to assess humidity levels is with an inexpensive humidity gauge. These are available at most hardware stores and big box home centers. A less accurate way is simply to try to "feel" how much moisture is in the air. Moderately damp: The space feels damp and smells musty only in warm, humid weather. Very damp: The space always feels damp and smells musty; walls and floor show damp spots. Wet: The space smells and feels wet. Seepage occurs, mold and mildew are visible. In the summer, outdoor humidity levels can reach 60 to 80 percent. Indoor relative humidity levels of 40 to 50 percent are generally recommended. Run your dehumidifier on the continuous setting (high) only until humidity drops to an acceptable level, then set the dial settings to as low as possible. Dehumidifiers are only effective at removing moisture when humidity levels are higher than 50%. This is usually in the summer. Using a dehumidifier in the winter months to remove condensation and frost from windows is not effective. If your dehumidifier is operating where the temperature is less than 65 F, check occasionally to see if frost is forming on the evaporator coils. If it is, turn the unit off until the frost melts and until the room is warmer. 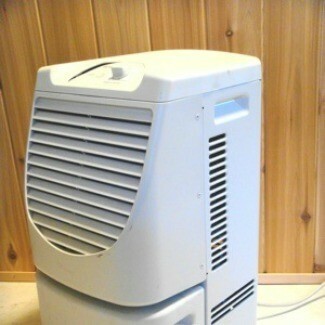 Depending on the model you buy, your dehumidifier may have air discharge vents in the top, side, or back of the unit. Make sure you allow for at least 12 inches of space around these areas so that air can flow freely across the internal coils. Air passing through the coils may carry dust, lint, and fungus spores. Clean dehumidifier coils annually, either with a vacuum, or by misting coils with a hand-held spray bottle and wiping them with a soft cloth. Keep windows and doors closed during use. The only time to open windows is when the outside humidity and temperature is low. One way to save a little money when using a dehumidifier is to use the full tank of water you have collected to water your plants. Works great and you have to empty it somewhere--why not in a pail to use for a good purpose. Great idea on reusing the water. Also remember to clean out the water collection area with a little bleach now and then.